Like a bulldozer ramming down a rollercoaster, ABORTED return to New Zealand to smash bodies without remorse, warning, or regret. ABORTED has been slinging skulls around since it’s wretched birth in Waregem, Belgium in the unholy year of ‘95. While the band originally had an entire lineup of members living in Belgium, ABORTED current lineup now features members from Belgium, The Netherlands and the United States, still delivering the unrelenting death metal they are known for. ABORTED have crunched their way through nine studio albums, four EPs and one live performance video album. The current line up includes vocalist, founder, and only constant member since the band’s inception, Sven de Caluwé, guitarists Danny Tunker and Mendel Bij De Leij, bassist Stefano Franceschini, and drummer Ken Bedene. 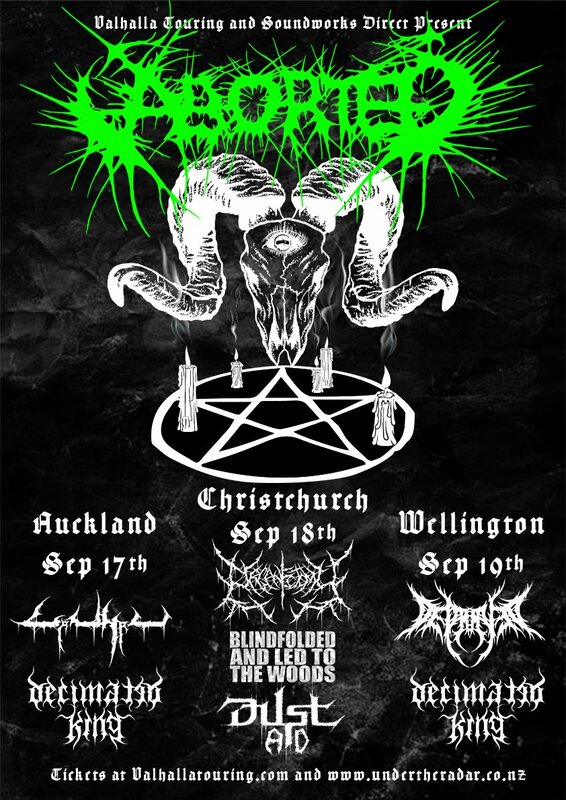 Catch this bone crushing tour on their second trip to NZ, it is not to be missed!